Isn't this just a great time to be out on the water? One day last week Jimmy asked if I wanted to leave work early and head out to Lake Lanier....sure. I had to run home and get a rod, and when I did, all I could find was my old 8 weight that only had a floating line on it - I couldn't find the 9 weight with the Rio VersaTip. Dang. Oh well, I figured I could maybe catch a couple of fish if we found some bass running baitfish. Sure enough, we did. We found a little mini-point with a couple of small coves on either side that had active fish. The spots were pushing bait to the surface, and try as I might, I couldn't hook up. 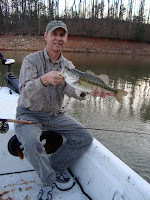 Jimmy was doing pretty well fishing an intermediate line, but I couldn't buy a strike with the floater. After about an hour and a half, Jimmy said "why don't you put my reel with the 8 weight sink-tip on your rod?" Hey - good idea! I really prefer to use my own rods, and I figured since the bait were pushing up on top and we were getting boils I should catch something...in spite of the results I'd had, so I didn't want to borrow Jimmy's 8 weight. Sometimes I can be pretty stubborn, but using his reel seemed like a good compromise. So, I pull my reel off and put Jimmy's on....and first cast: fish on! Then a few minutes later a double...some misses and then another fish. Put the fly in front of the fish. I've preached it hundreds of times when talking to customers about nymphing for trout...you'd think I'd heed my own advice! The sink-tip made all the difference. We ended up with about 10 or 12 spots between us in the 2-pound-ish neighborhood on chartreuse Clousers...lotsa fun for a couple hours after work! You can bet I'm not going out after bass again without a non-floating line anytime soon...and you shouldn't either!